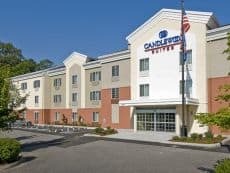 This all suite hotel makes you feel at home with a variety of choice amenities including complimentary laundry services and an on-site store with entrees, snacks and drinks when you’re tired of eating out. Other amenities include complimentary high-speed, wireless Internet access, a business center and a fitness center. 80 rooms – Kids are welcome.